The SHAN Nº5 is our new full-suspension frame, entirely constructed from 4130 MCS CrMo steel. 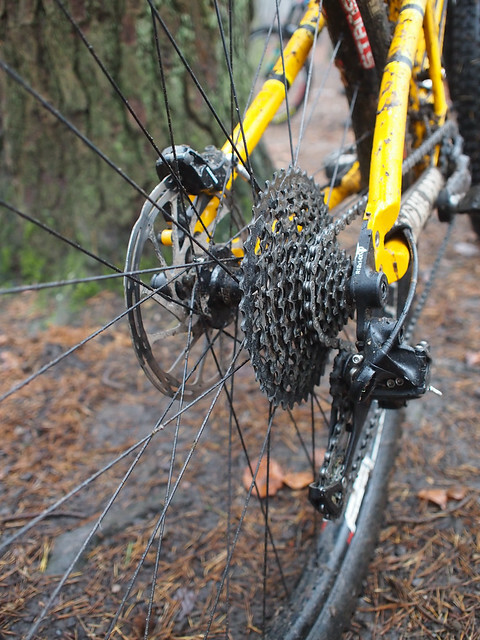 This is bicycle versatility at its best! A trip up into the mountains? A ride out with your friends? A weekend playing in your favorite bike park? How about a round in your local Enduro race? The SHAN N°5 can do all of that, easily excelling in each domain, for as long as you can ride! I’d seen several Production Privees in the past, indeed several of my mates have them, but I’d never really looked close up, or indeed had a ride. I was returning a demo bike to D&D Cycles for my wife and the conversation got round to my old aching bones somehow! I usually ride either a hardtail or fully rigid bikes, albeit 29+ and fatbikes. I do tend to get a bit beaten up, especially on more technical trails and the boys suggested I give the Shan No.5 a try. Now bearing in mind I’m not really the target market for this bike I thought it would be interesting to see what it was like. My rides are usually longer and although they do have singletrack and technical descents in them, they also include a lot of miles in between these sections, so whatever bike I ride needs to be able to cover the distance and not be shy of some climbing too. That said though I still love ragging it downhill and chasing my mates to the bottom. D&D have a couple of different options for the demo bikes, a 160 / 140 one and a 140 / 140. 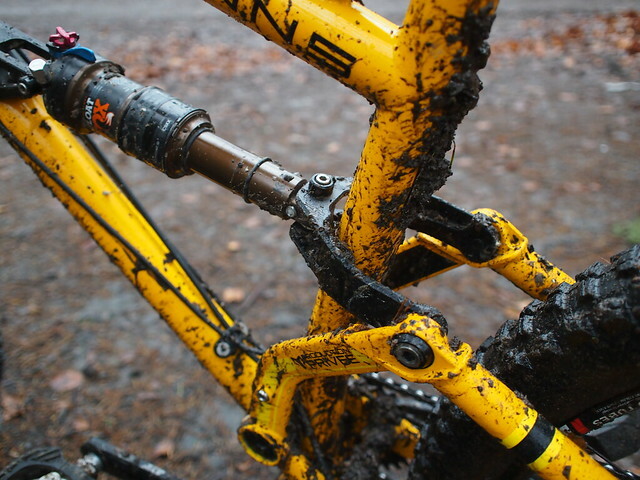 I picked that as I still like to feel involved with the trail and I didn’t fancy climbing with a 160 fork up front. The Shan sets itself apart from most by its slender steel tubes and it gets a lot of admiring glances out on the trail! There are some great features too. It has a tapered headtube as is standard these days. The main pivot bearing is a press fit BB so it should be pretty bombproof and at least it will be easy to replace when the time comes. The rear end is boost spacing as is the way these days too. There’s also a healthy amount of mud clearance back there and it will swallow up a 2.8″ tyre should you feel the need to go for plus wheels, and to be honest I reckon this bike would be an unstoppable enduro monster with bigger rubber on it! 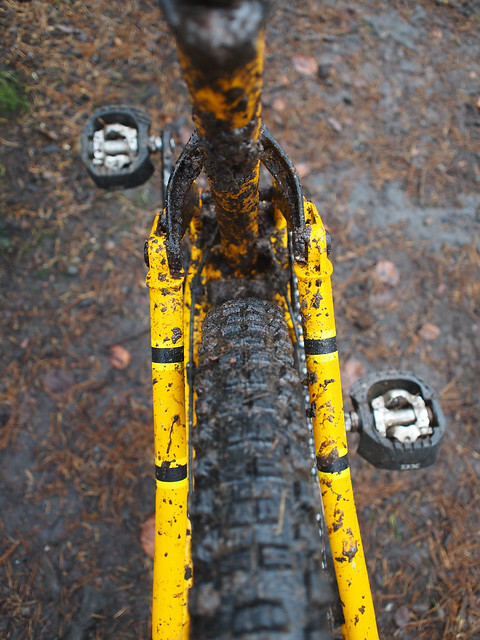 Not that I had any grip issues with a more standard tyre width and the conditions were pretty wet and slippery. 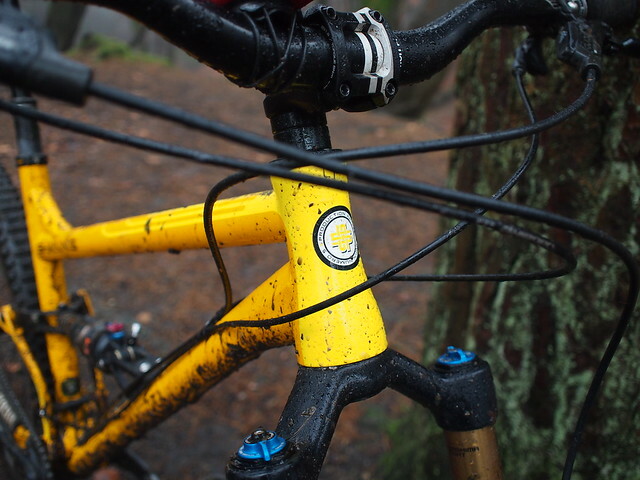 The demo bike also came with Production Privee’s own bar, stem and grip combo. This is worth a mention as there has been some interesting innovation here. The bars are laser etched with lots of measurement lines so you can line up both the angle and the distance in of your controls perfectly. The final little twist here is the grips though. They are marked on the lock on collars and as you rotate them you can either increase or decrease the back sweep and up sweep of the bar by up to one degree depending on the position you set them to. Pretty clever stuff and great if you are looking to really dial in your position. So how does this thing ride? Well as I said right back at the beginning I’m not really the target market, but I wanted to take the bike out and really give it what would represent some ‘normal’ rides for me. 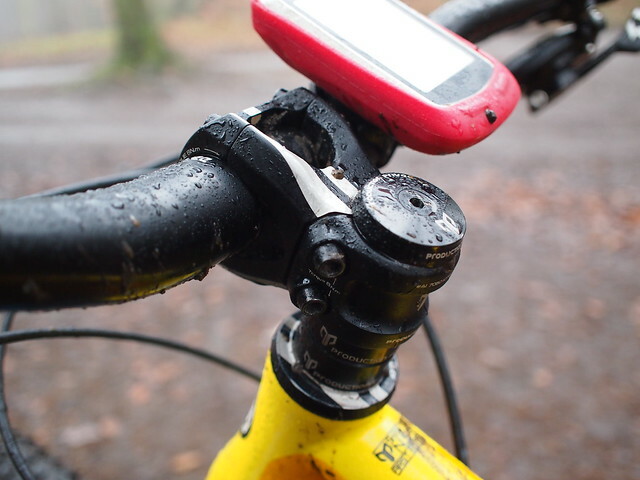 On the saturday I was guiding a ride for Quest Adventure on the South Downs from Worthing, it was a mix of bridleway and singletrack and we did 28 miles with a big chunk of climbing thrown in just to see how the bike did (sorry about that guys ;-)). After I’d got the air in the tyres dialled, I put it up to 20psi which is what I usually run, it rolled along nicely. 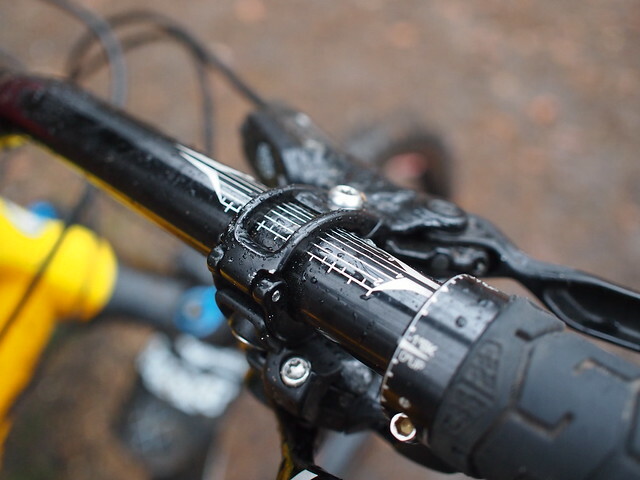 Initially I was struggling a bit on the climbs, but once I started using the climb switch on the rear shock and the fork I found it was quite easy to climb on as long as I wasn’t in too much of a hurry. By contrast the descents were a blast, several long bridleway descents were done in top gear and total comfort. The rutty, chalky gulleys on the singletrack were dispatched easily, with only my sense of self preservation holding me back. In fact I got a third overall on one descent, which was quite a surprise to me. 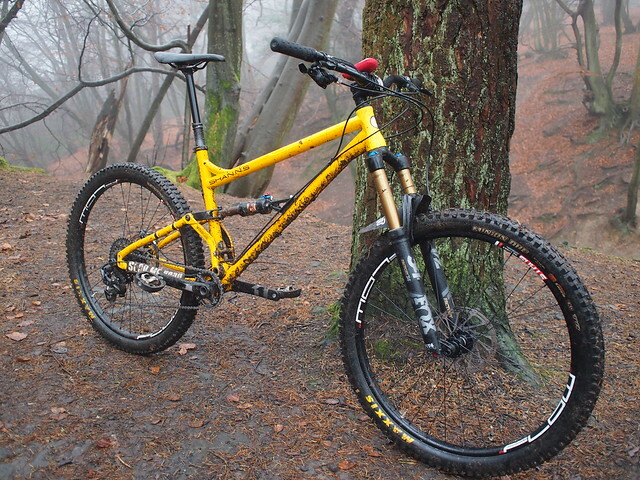 So if you’re looking for an absolute trail ripper this would be a good place to start, I would imagine if you tried it with a 160 fork in stead of the 140 I did you could really get yourself into trouble!! 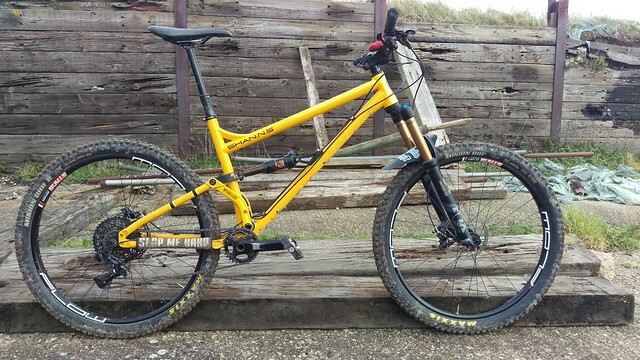 If you’re looking for a mid travel ‘Enduro’ (I hate that word) style bike get yourself over to D & D Cycles and take this bad boy out for a spin. I really did have an immense amount of fun on this bike!